An unorganised and messy desk is productivity’s worst enemy and if you want your boss to like you (and not notice how much time you spend slacking on the internet each day) then it’s best to declutter your desk and get organised. Check out these handy products and tips we’ve seen around the internet to help you get the most out of your desk space and your work day. A desk organiser is an easy way to make sure that you don’t end up with papers pens etc. all over the place. These few below are inexpensive and you could probably get your company to buy it if you put a good enough case forward – it’s worth a try! This simple and trendy wire desk organiser is just £8 from Swedish furniture experts, IKEA, is one of the best options for decluttering your desk we’ve seen out there. The cage exterior means that it’s barely visible compared to a more solid classic organiser and it has enough space to hold pens, notebooks and chargers with no problem. Eliminate piles of papers on your desk by pinning crucial tasks and notes to a pin board behind your desk! This clears up space on the desk itself but can also be a cool looking addition to the space. 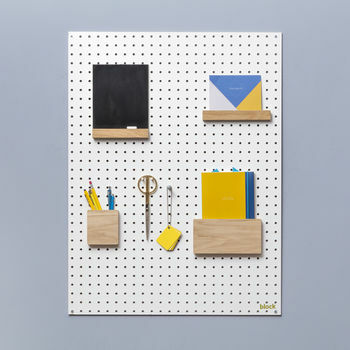 This pegboard is one of the cleanest and most affordable I’ve spotted around. The simple white colouring allows for it to blend in with most office wall space and also allows anything added onto it to standout so you don’t forget anything important. The board also has the option of multiple add ons to improve the storage options, from small shelves to stationary holders meaning you can get as much as you like on the board and keep your desk decluttered. Plants may not help to declutter your desk but once you’ve done that they are an easy way to brighten up your workspace and they’ll even emit some oxygen to make sure to keep you going! ‘No-hassle’ plants are those that don’t require much care and no one in the office can be responsible for killing them when you go to Greece for two weeks. We’re talking succulents and the likes, ones that are fairly small in size and require nothing more than a spritz every few days to keep them going (sounds like us in the summer). This Crassula Marnieriana from Forest is a great option for your desk. It’s not too big, prefers not to be in direct sunlight and needs to watered sparingly – Perfect! The main issue in workspaces and offices is a build up of printed out information that has no actual home! Why not, instead of printing out copies of everything, upload all your documents to the cloud or keep everything safe on your laptop and make it accessible from your home computer if you need to. This ensures that you aren’t rifling through papers for information and you have so much more space for plants and other unnecessary ornaments on your desk. If you have an archive of documents printed out that you aren’t prepared to digitalise then give us a call at bySTORED and we’d be more than happy to take them away and store securely in our warehouse so they’re out of sight but can be returned to you at short notice should you need them.